FILTRATION (Volume 16 Number 4) is the official journal of The Filtration Society and the American Filtration & Separations Society. David Chezaud; Scientific Director and Founder; FlowerSEP, Village d’Entreprises Lasserre 47310 Estillac, France. This paper describes some of the features of new equipment for laboratory scale filtration testing. 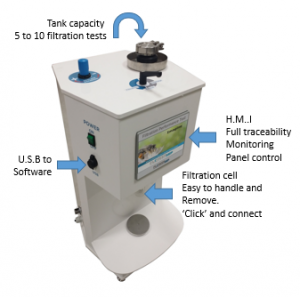 Descriptions are provided for the Filtration Performance Test, which facilitates the automated acquisition of constant pressure filtration data, and Filtration Performance Software which facilitates data analysis, including the automated calculation of characterising parameters such as specific cake resistance and cake compressibility. 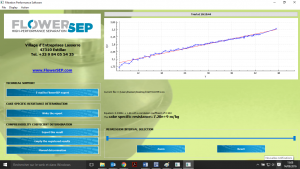 Exemplar experimental data are presented to show equipment/analysis performance in relation to repeatability measurements, filtration cell diameter, particle diameter and particle shape. The use of the approach to aid process scale equipment specification is also considered and some examples are given. • amortise more quickly the investment on equipment. • data back-up from trials. The Filtration Performance Test repeatability and the use of a 1 cm diameter cell were validated by means of a range of experiments with the FPTLab. Different measurement possibilities were shown. The FPTLab is a new device that allows a quick and reliable measurement of specific cake resistance and cake compressibility coefficient. Knowing these parameters can guide a choice of industrial equipment or predict the impact of product variability on the whole process. Use of the FTPLab also allows the prediction of bottlenecks in an industrial process. For research and development units, it allows an optimization of operating pressures for the solid-liquid separation step. More over with the cell of filtration ‘clik’ and connect, you can quickly select the filtration media adapted to your needs.